Great for Southern Rock Themed events. Meet and Greet. Photo opts. 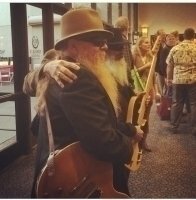 Since the release of the band’s debut album in January 1971, ZZ Top has become known for its strong blues roots and humorous lyrical motifs, relying heavily on double entendres and innuendo. ZZ Top’s musical style has changed over the years, beginning with blues-inspired rock on their early albums, then incorporating new wave, punk rock and dance-rock, with heavy use of synthesizers. One of the best-selling musical artists in history, the band has had global album sales in excess of 50 million as of 2014. 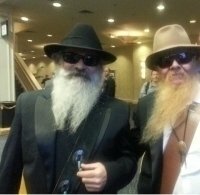 ZZ Top was inducted into the Rock and Roll Hall of Fame in 2004, and has garnered 11 gold records and 7 platinum (13 multi-platinum) records; their 1983 album, Eliminator, remains the group’s most commercially successful record, selling over 10 million units. ZZ Top also ranks 80th in U.S. album sales, with 25 million units. The band is known for Hill’s and Gibbons’ trademark beards.